Andrew Little is not a charismatic or populist leader in the mould of Lange or Key but he is clearly a strong leader for bringing together different factions and building a team in a similar way that Jim Bolger did for National when he successfully worked with Winston Peters. When we are rebuilding a country we need solid rather than shallow and flaky leadership. 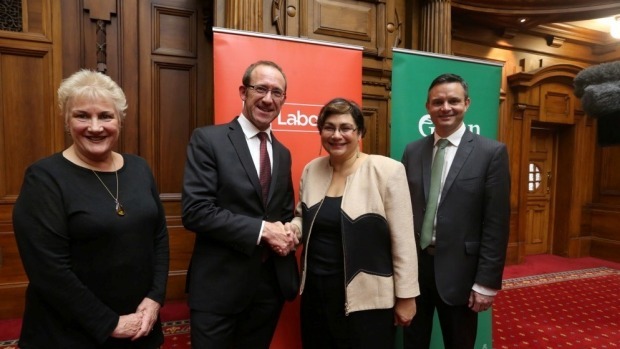 Metiria Turei has become a rock for the Greens after the resignation of Norman. She is now the most experienced Green MP and a strong speaker in the House. She would make a solid deputy PM and her warm and easy manner would compliment Little's more stolid approach. I can also see Metiria making a great Minister of Justice, as a Maori woman and a lawyer she would provide a much needed different perspective to this portfolio. Annette King has a wealth of experience and is a cheerful, rarely flustered performer and would be a useful Minister in a number of portfolios. Grant Robertson has a sound knowledge of the finance portfolio and is an intelligent and able operator. Jacinda Adern would make a very good Minister for Social Development and I am sure she would quickly establish some measures for child poverty so that we can clearly track progress in addressing this problem. Jan Logie would make a very useful Associate. James Shaw's international experience and business background would make him an ideal Minister for Trade and Industry. He has already impressed the business community and is aware of the potential of new markets and technology. David Parker would be a highly competent Attorney General. Kevin Hague would make a great Minister of Health. He is a past CEO of a DHB and has impressed with his understanding of the portfolio and his ability to work across the house to find solutions for our many health issues. Kennedy Graham should be the Minister for Climate change as he as a real grasp of the economic and environmental issues involved. David Shearer would make an able Foreign Minister with Kennedy Graham an obvious Associate. Julie Anne Genter would make a highly competent Transport Minister. She has a background in Transport management and economics (she is currently the Greens Finance Spokesperson) and has had National's Transport Ministers struggling with her well reasoned and researched questions. Chris Hipkins has increasingly impressed with his understanding of the Education Sector and he has become one of the rising stars in Labour's lineup. Catherine Delahunty would make a superb and experienced Associate Minister as she has huge respect within the education sector. Eugenie Sage would make a highly knowledgeable Minister of the Environment or Conservation. Her knowledge and understanding of either portfolio would be substantially greater than anyone else in Parliament. David Clendon would make a very competent Minister of Commerce or Corrections he has a strong understanding of both portfolios through his business background and interest in prison reform. Phil Twyford would make sure that a Labour Green Government addressed our housing crisis in a practical way. Gareth Hughes would make a very enthusiastic and competent Minister of Science and Innovation. he already has the support of the IT industry as one of the few MPs who actually understands the sector. This is only the beginning of a possible line up and just my own attempt at matching skills with portfolios, but already I am excited about the prospect of change and seeing some caring and competent people in the Government benches. Who knows what extra talent may appear in both parties after the election, I know the Greens have a strong list of reserves already. All we need to do now is break through National's lies and spin and promote this alternative for a more progressive and compassionate future. As for Winston Peters and New Zealand First... I reckon Winston would make a good fist of the railways portfolio and perhaps we could have a Minister for the Gold Card. Winnie for immigration and foreign investment. The mentality that says "transport" and "railways" are different things is divisive and unhelpful. Julie Anne Genter would make an excellent minister of transport and moreso if her remit included railways. All good. I wasn't having a go at any individual. The way things are framed we are asked to see rail as something apart from transport. That framing is nonsense. Of course you are right AC transport must be regarded in a holistic way, it is just about Roads of National Significance, railways are actually carrying a greater amount of freight than they ever have apparently, and what is on rail isn't on our roads.